Treasure Chest is made up of yellow and rose gold shard glitter suspended in a clear polish. It's not the kind of glitter that I'm usually attracted to, but I can't stop staring at my nails with this on them. For this photo I layered it over China Glaze's VII (which I posted about here). This is one coat with top coat. A little placement was needed to make sure the glitter was distributed evenly, but it was minimal. While you'd be hard pressed to get this glitter opaque, I think it adds a little oomph to, what would typically be, a rather boring manicure. I love the way Treasure Chest catches the light and the rose gold looks gorgeous against the red/purple in VII. One of the main reasons why I don't wear a lot of glitter like this is because I find it sticks up in weird and annoying ways, even with top coat, but because the base of this polish is so fast drying I was able to gently pat the glitter down so none of it ended up stuck up through the top coat. 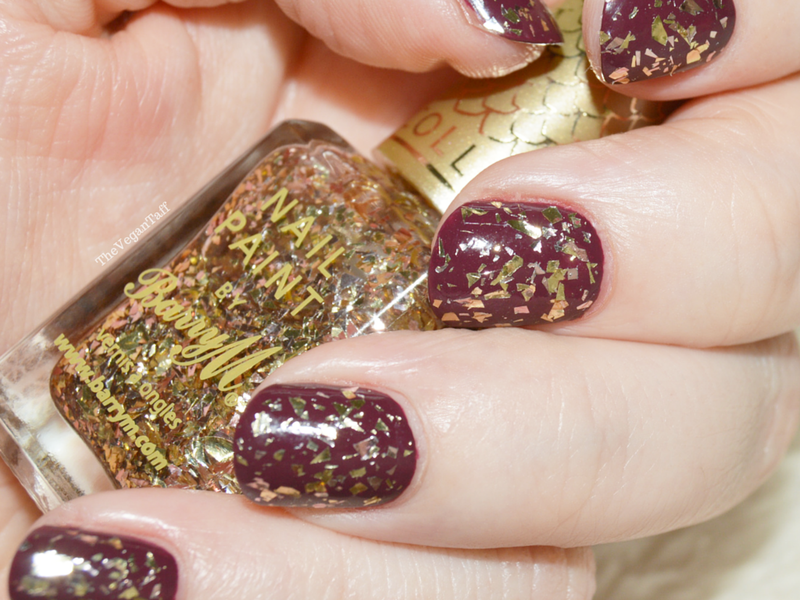 Treasure Chest by Barry M is available online or from Superdrug stores nation wide and online for £3.99. What do you think of this mani? What kind of polishes would you pair it with?